Being smart and being wise are not the same thing. Plenty of smart people are fools, and God gives wisdom to whoever asks and He does so liberally. He wants His people, all of His people, to be wise. Wisdom isn’t reserved for the “smart”. It is the ability to see beyond the visible. Anyone can have this if they seek God. Our action focus is being a MASTERMIND. Our Biblical Truth is Wisdom. 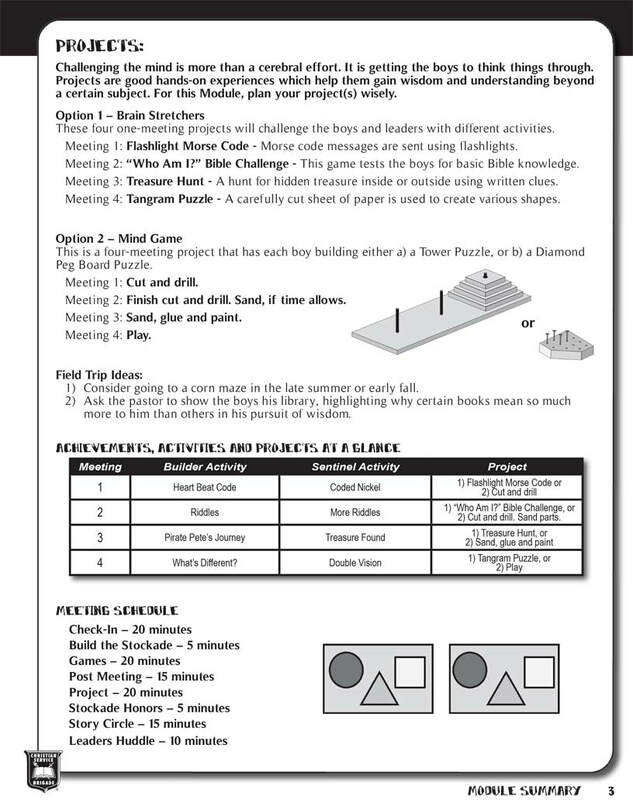 EXPLANATION -- Page 2 - SUMMARY, Meeting 2 - Purpose: The "1-Meeting Project" is what it says: a one-meeting project option which is completed within this meeting. See the "PROJECTS" section for further details. EXPLANATION -- Page 2 - SUMMARY, Meeting 4, James 1:5 Passage note: It says "This is the Sentinel Verse", which means that besides being the Passage for this meeting, it is also the Sentinel's Memory Verse for the Module. It is listed in the boys' Outpost Adventure. TYPO -- Page 4 - MEETING 1 - Check-In: Fourth sentence - "include" should be "includes". For the Code Breakers game, instead of a jacket rolled up to hide the solution, why not just hang a leader's jacket over the back of a chair so that it touches the floor? Editor's note: That will work. You want something that will allow the solution to be in the game but not seen by the other side until a winner is declared. Great idea. For Option 1 - Flashlight Morse Code, we found that a flashlight with a push button really helped. In fact, we used two per Post to keep the boys busy. Editor's note: A push button would help but a hand covering the bulb and lifted for the dits and dahs is as effective. Two flashlights per Post is a great idea! Smartphones with a Flashlight App can work in a pinch. 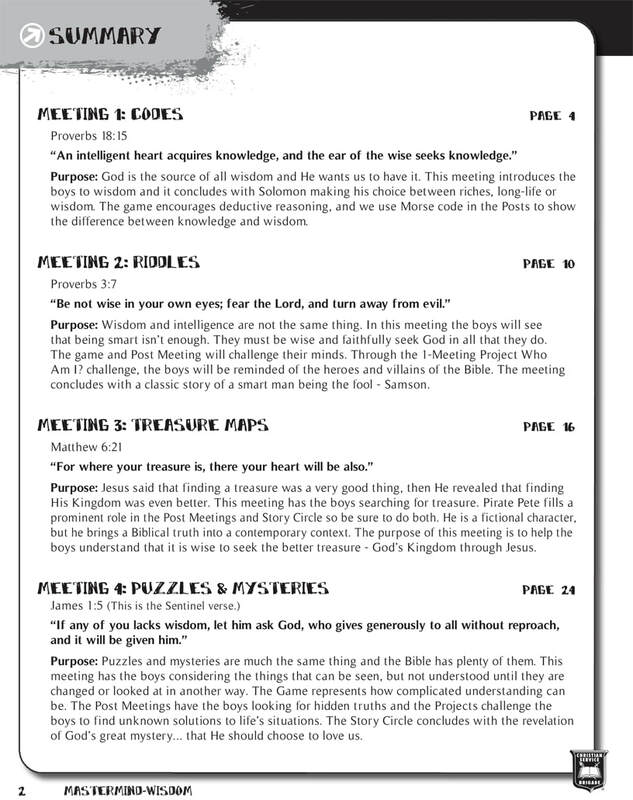 EXPLANATION -- Page 8 - MEETING 1 - Story Circle: The Young King's Request: Question: Was Solomon really 12 years old at this time? Answer: No one knows for sure, but according to Jewish scholarship, he was indeed 12 years old. However, like all things Biblical, others have suggested that it cannot be so. Some say he was 14, others 13, and Christian scholars say 20 or 21. This Story Circle's author chose to go with Solomon's own testimony, "I am but a child." EXPLANATION -- Page 8 - MEETING 1 - Story Circle: The Young King's Request: Question: Is it okay to suggest that a boy can ask for wisdom and expect to receive other gifts from God? Should we be teaching him such selfishness? Answer: James 1:5 says, "If any of you lacks wisdom, let him ask God, who gives generously to all without reproach, and it will be given him." God promises to give wisdom, generously and without finding fault. And, using Solomon's example, we can see that with wisdom come other gifts. It sounds self-serving, but the wisdom itself should temper the selfishness. For the Four Cups game, we used plastic cups and set the four corners between 6 and 8 feet apart. Worked well. Editor's note: The cups can be any material, even beanbags or rocks (for when you're camping). For Option 1 - Who Am I Bible Challenge, how big is the space that we are supposed to move the chair? Editor's answer: It's your decision, but if you don't have lines or squares on the floor, make a space the length of the chair. The boys will figure it out. For Option 1 - Who Am I Bible Challenge. Hey, can we get the Who Am I cards as a downloadable pdf? Editor's answer: Sure thing. 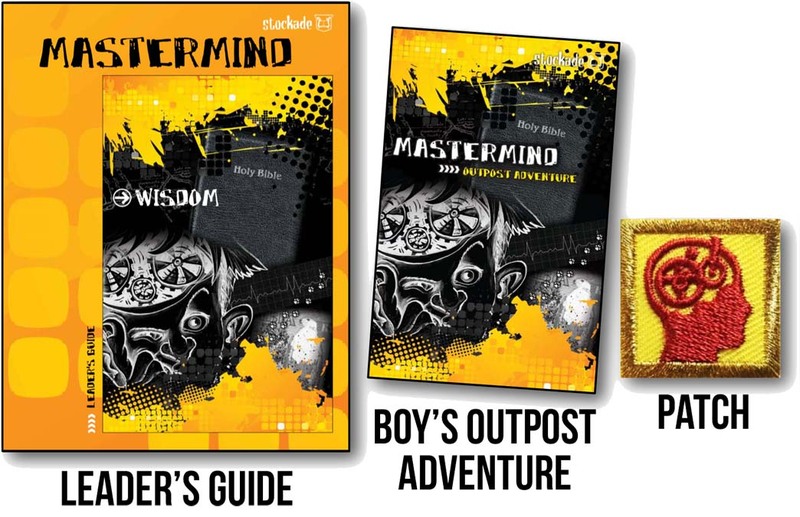 See the MASTERMIND Project Pages, below. PRINTING ERROR -- Page 18 - MEETING 3 - Post Meeting: While this is an Outpost Adventure printing error, it affects this Post Meeting. 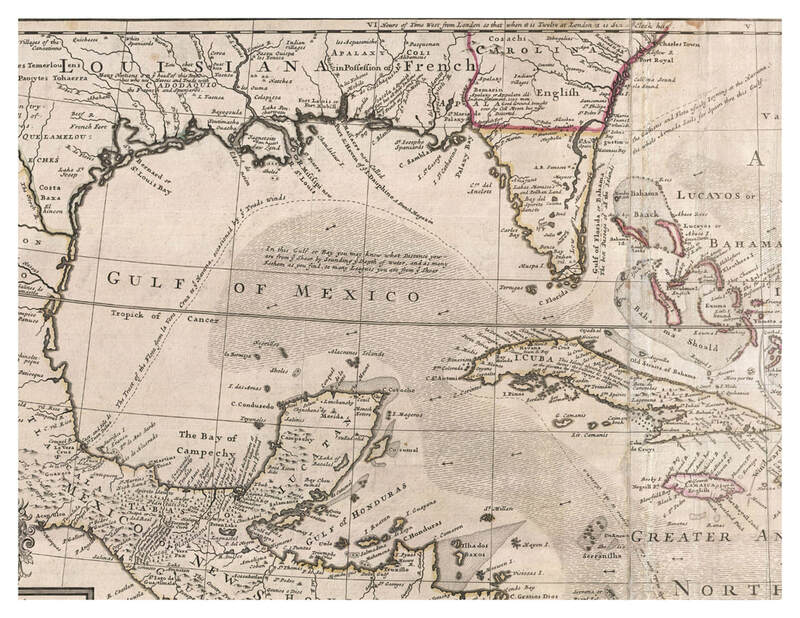 The Hermon Moll Map of the West Indies, a portion of which is found at the center-fold of the Outpost Adventure is difficult to read. In the US-printed version, it has a white border running through the center of the map (the Canada-printed version avoided this problem). 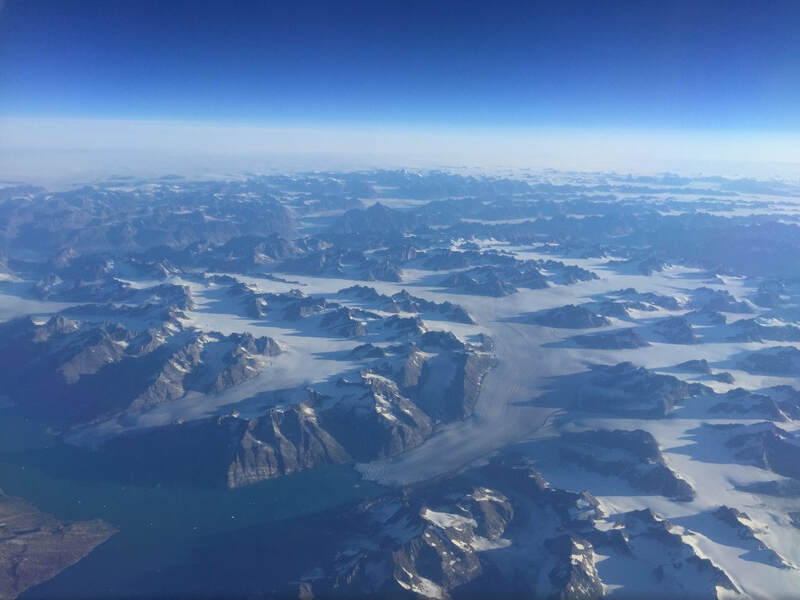 Below is a medium resolution image that may be useful on smartphones. Below that is a downloadable high resolution pdf. 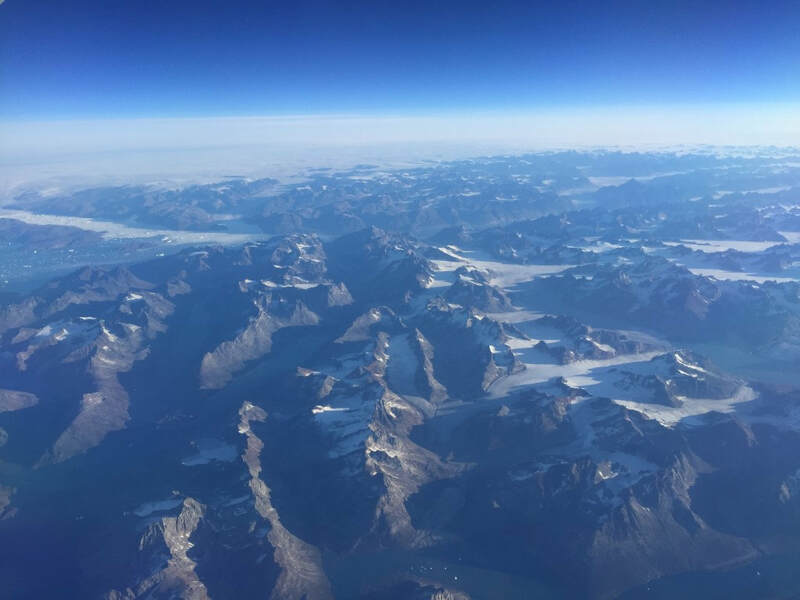 Clue 1 - Easy. Find Vera Cruz and you're there. Clue 2 - Easy. The route is drawn on the map. Clue 3 - A little tougher. Try looking for "Lak e de" with "l'Asce nsion" on a line below it. Yup, it's as plain as day once you can recognize it. It's the "west arm" of the Mississippi River. The rest of the clues are straight forward enough and even if you are off a little, you will be close enough. However, the clues may be clearer if they were bigger to read. 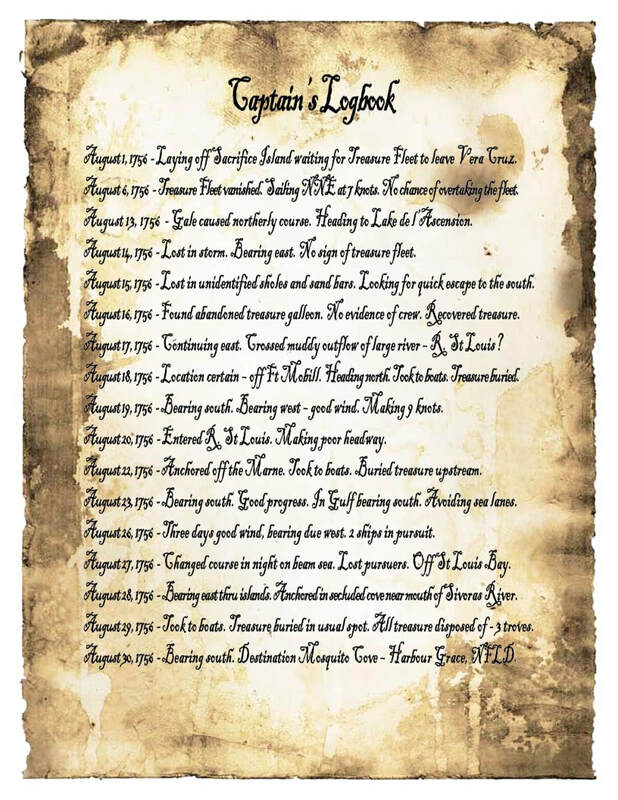 A graphic of the Captain's Logbook is below, followed by a downloadable high resolution pdf file. PRINTING ERROR -- Pages 27 & 34 - MEETING 4 - Project - Option 1 - Tangrams: The Tangram template is printed oversized in the USA printed version, eliminating the border cut-lines. (It's fine in the Canadian printed version.) Download the "tangram_template" pdf to get a template showing all the cut-lines. For Option 1 - Tangrams. Our Leader's Guide does not have 3 of the 4 outer borders showing. Therefore, these lines have to be drawn in with a straight edge. Best way is to extend the diagonal lines to where they intersect other lines and use those points to draw in the missing borders. They are about 1/4 inch from the edge of the paper. Editor's reply: Thanks, Mike. That really helps us with an immediate solution. We will be fixing the problem in future printings. Clue 3 - A little tougher. Try looking for "Lak e de" with "l'Asce nsion" written on two lines, with a longitude line running through it. Yup, it's as plain as day once you can recognize it. It appears to be the "west arm" of the Mississippi River. Can you explain the significance of the final clue in logbook for PIRATE PETE'S JOURNEY? It says, "August 30, 1756 - Bearing South. Destination Mosquito Cove - Harbour Grace, NFLD." Editor's answer: The author says that it completes the story: where did Pirate Pete go? Now, the Pirate Pete story is pure fiction. 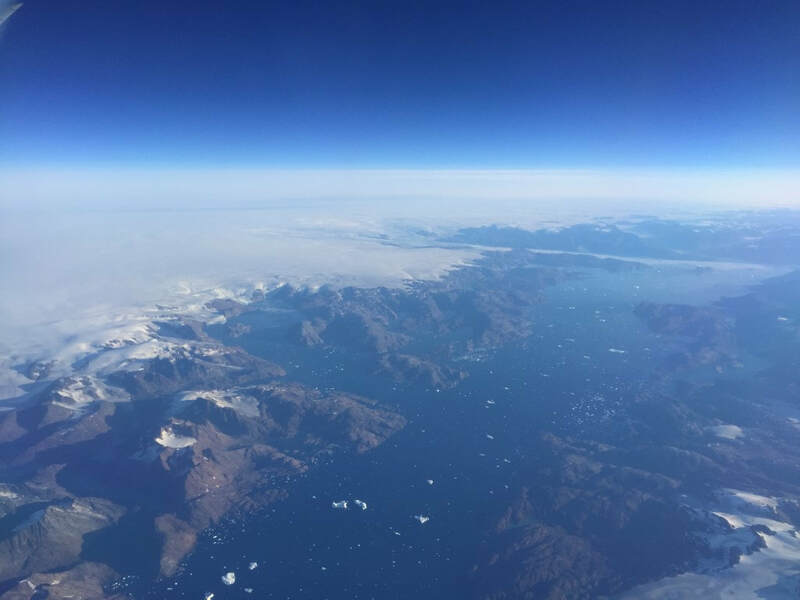 However, 100 years earlier, Mosquito Cove was a major pirate base on the island of Newfoundland (NFLD) off the northern east coast of North America. The author's ancestors landed there with Pirate Captain Peter Easton. Harbour Grace was named after the matriarch of the Pike family, the Irish princess Sheila Nagira. Pirates of the West Indies commonly rested in the relative safety of Newfoundland. PRINTING ERROR -- Pages 8 & 9 (center-fold) - Hermon Moll Map: The Hermon Moll Map of the West Indies, a portion of which is found at the center-fold of the Outpost Adventure is difficult to read. In the US-printed version, it has a white border running through the center of the map (the Canada-printed version avoided this problem). Below that is a very handy downloadable high resolution pdf. There was a rain delay cause by a heavy downpour that erased all the footprints in the sand from the earlier part of the game. 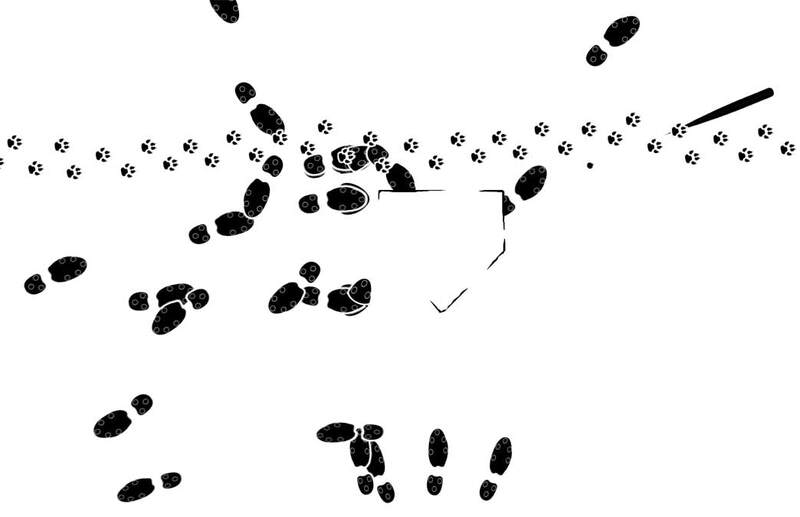 The bottom set of footprints belong to the catcher. He stepped into the picture from the bottom (left edge) of the page. One batter came up, set his feet and hit the first pitch. After all, he doesn't reset his feet for another pitch and the catcher doesn't do much moving. The batter strolled off toward first base, but didn't run, so obviously it must have been a home run. One runner strolled to home plate - it was probably the batter, but it could have been a runner who was already on base. If it was a runner then why didn't the batter walk back past home plate after the run scored? In any case, a run did score ending the game. The runner who scored picked up home plate and walked off the field. The catcher walked off the field, as well. The bat got picked up by someone just out of view to the right of the picture. Shortly after the game, a dog walked through the area. In any case, the game must have been tied in the bottom half of the last inning when a heavy shower forced a delay. The next batter came up, hit a homer, scoring the winning run. Everyone went home and then the dog came along. End of story.